Everybody knows this beautiful couple as James and Florida Evans from the hit TV show Good Times that originally aired from 1974-1979. As the first sitcom ever with an African American two-parent family, it was extremely successful; They filmed 133 episodes, and everyone of them are still in syndication on various cable and public TV channels around the country. To this day, people absolutely love the Evans. 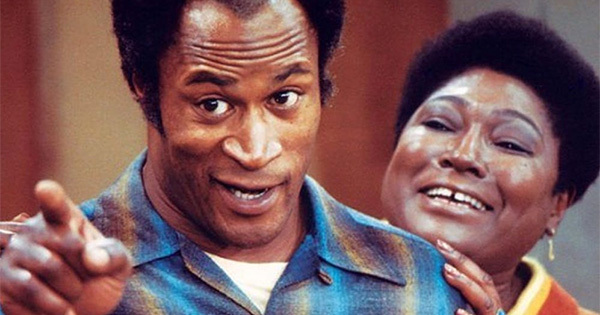 However, although they may have seemed like a real family on screen, behind the scenes James Evans was actually a talented actor named John Amos. And Florida Evans was actually a talented actress named Esther Rolle. #1 - John Amos graduated from Colorado State University in the 1960's with a degree in sociology. He also played football for the Colorado State Rams, and later was a Golden Gloves boxing champion. #2 - He almost played professional football, and actually signed a free agent contract with the Denver Broncos. He was released, however, after just two days at training camp because he pulled his hamstring. #3 - His first major role in acting was as a character named Gordy Howard, the weatherman on The Mary Tyler Moore Show. He played this role from 1970 until 1973. #4 - He even appeared in a McDonald's commercial in 1971. #5 - Although he went on to win the role as James Evans on Good Times in 1974, he actually only appeared in 61 of the 133 episodes. His character died in a car accident during the 4th season, and the series continued for three additional seasons without him. #6 - In 1977, he co-starred in the ground-breaking television miniseries, Roots, based on Alex Haley's best-selling book. His performance earned him an Emmy nomination. #7 - From 1984 to 1985, he portrayed a character named Captain Dolan on the hit television show Hunter. #8 - In the 90's, he was a frequent guest on the hit TV show The West Wing as Admiral Percy Fitzwallace, whose character was a Chairman of the Joint Chiefs of Staff in the White House. #9 - Also, in the 90's, he also made several guest appearances on quite a few hit sitcom TV shows including The Cosby Show with Bill Cosby, The Fresh Prince of Bel-Air with Will Smith, In the House with L.L. Cool J, and Martin with Martin Lawrence. #10 - In 2003, he co-starred with Anthony Anderson in the short-lived TV series All About the Andersons. #11 - In 2009, he released a country album... yes, a country album with original country music songs that he wrote and produced. #12 - As of 2018, he has won more TV Land Awards than any other actor or actress, taking home several trophies for his various roles on The Mary Tyler Moore Show, Good Times and Roots. #13 - First off, her parents were from the Bahamas and migrated to the United States before she was born, which officially makes her nationality Bahamian American. #14 - She was the tenth of 18 children, and two of her siblings also pursued careers in acting. #15 - She initially studied at Spelman College in Atlanta, and later studied at Yale University in New Haven, Connecticut. #16 - For many years, she worked a traditional day job as a salesperson in New York City's thriving garment district. #17 - Her first appearance on-screen as an actress was a very small, uncredited role in To Kill a Mockingbird, the classic Oscar-winning film that was released in 1962. #18 - Her first major gig as an actress, however, was in 1971 when she played the role of Miss Maybell in the Melvin Van Peebles play, Don't Play Us Cheap. #19 - In 1972, she won the role of Florida Evans on the hit sitcom Maude. When that show was cancelled in 1974, she continued to play that role in the spin-off series which was Good Times. She appeared in nearly every episode, and in 1976, she was nominated for a Golden Globe Award for Best Actress in a Television Series. #20 - While filming Good Times, most people had no idea that she was actually 19 years older than her on-screen husband, James Evans. #21 - During the entire 5th season of the show, she did not appear in any episodes. But she did return to the show for the 6th and final season. #22 - During the 80's and 90's, she appeared in several made-for-TV movies and films, including Driving Miss Daisy, My Fellow Americans, Rosewood, and Maya Angelou's I Know Why the Caged Bird Sings. #23 - During the early 90's, she appeared in several psychic hotline TV commercials and her infamous line, "Tell them Esther sent you," became a national trademark. #24- She was married for 20 years, but never had any children. #25 - Sadly, she died in November 1998 from complications of diabetes, but reportedly she left an estate worth more than $1.7 million dollars including $200,000 in cash, a $400,000 home, and more than $1 million in treasuries. She also reportedly owned 1,000 shares of Bethdames Corporation, several mutual funds, and a 2% interest in El Toro, Ltd.